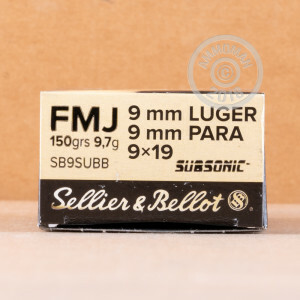 This 9mm cartridge by Sellier & Bellot features a muzzle velocity of 1,000 fps, which is 125 fps slower than what it would take to break the sound barrier. That means it’s far quieter to fire it than other comparable rounds, a huge benefit both to your ears and those of people around you. Fire it from a suppressed pistol and you’ll barely make any noise at all, which is perfect for discreet and comfortable training and target practice! This round features a 150 grain projectile, which is very heavy for its caliber and compensates for its lesser muzzle velocity. The bullet’s full metal jacket will protect your bore from rapid fouling, and also toughens it for satisfying target penetration. 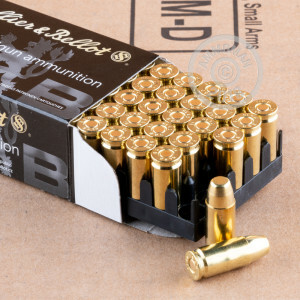 This round’s factory fresh brass casing and non-corrosive primer are indicative of Czech manufacturer Sellier & Bellot’s commitment to always giving their customers great quality, and suit it for handloading as well.